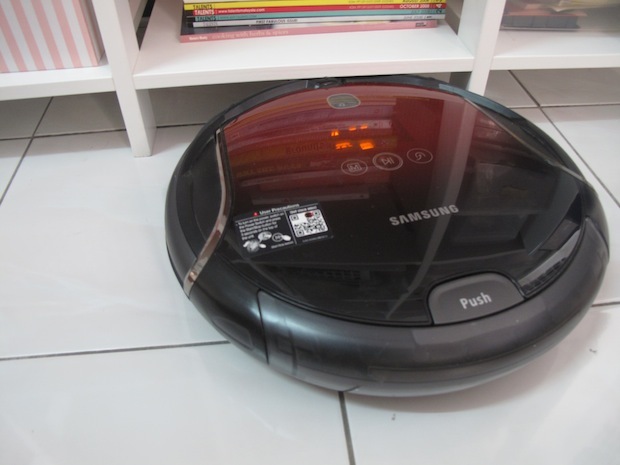 Ever since I’ve enjoyed the convenience of having a LG Hom-bot , I am certain I would like a robotic vacuum cleaner at home. 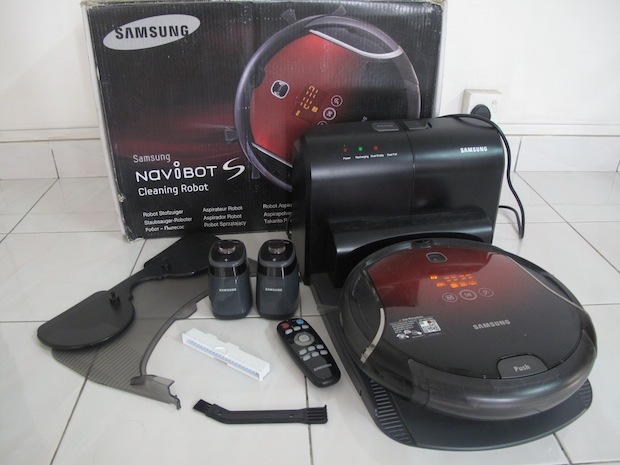 Eager to try out more robotic vacuum cleaners to see how differently they function, I tested Samsung Navibot S vacuum cleaner for a week. Plug the power cord of the dock, secure Samsung Navibot S on it and let it charge. 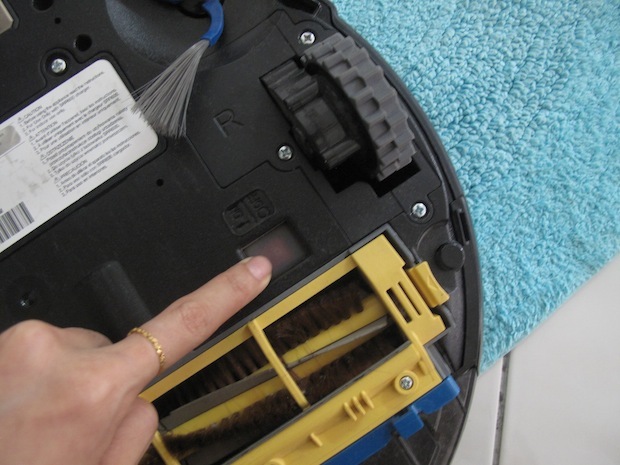 When the robot is fully charge, press the button on the machine or on the remote control to start cleaning. It will automatically move all around the house and cleans the floor through a suction at the bottom. At the same time, it will map the house with a camera. When the bin is full, the robot will return to the charging dock by itself. Cleans well – The suction at the bottom of the cleaner absorb dust and dirt efficiently, leaving the floor squeaky clean. This level of cleanliness is impossible to be achieved using the traditional broom. 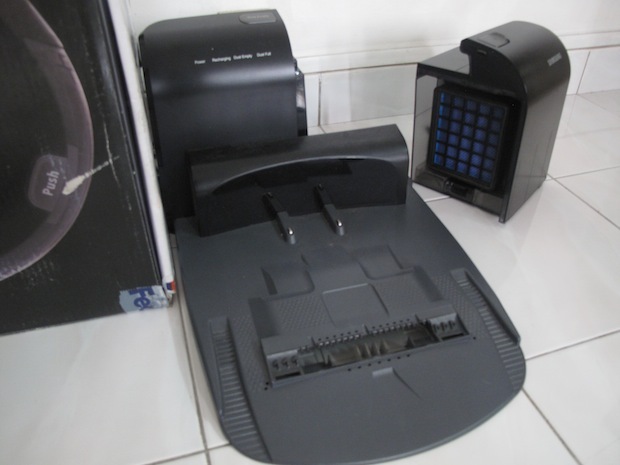 Easily removable plastic bin – At the side of the machine, there is a rounded plastic dustpan which can be removed easily. 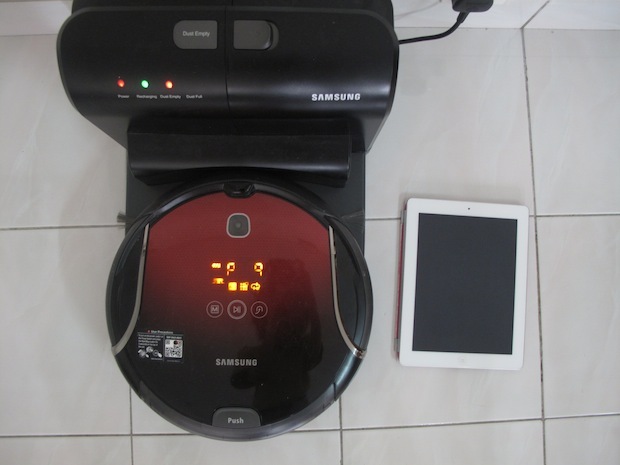 Auto recharge and auto dust emptying– – When the dustpan is full, Samsung Navibot S will return to the dock and deposits dirt into the auto-emptier dustbin. Huge bin capacity – The emptier dustbin is huge. It means that you don’t have to clean the machine very often. 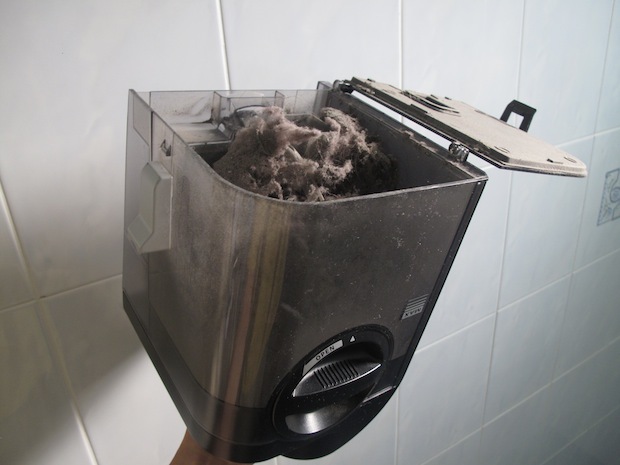 Easy to clean – Besides the dustbin and filter, the auto-emptier dustbin, it’s cyclone and the filter need to be cleaned. We would have prefer if there were less compartments to wash. Having said that, the parts are made of plastic so cleaning is not difficult. Noisy – We did not expect the machine to generate so much noise since it was advertised as being silent. 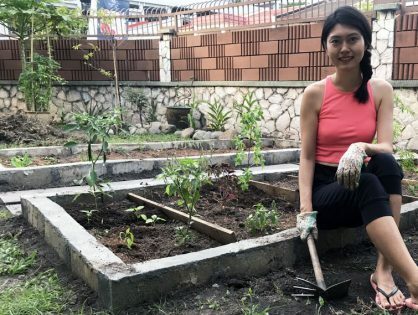 When the bin empties by itself, it sounds like the traditional vacuum cleaner (Check out the video below). It last for more than a few minutes. This means that you probably don’t want to use it when there are guests or babies around. Stuck under furniture and falls off low steps – It stuck under our shelf and shoe cabinet and unable to get out on its own without help. It also falls of low steps. This is troubling as I cannot leave it to work on its own. 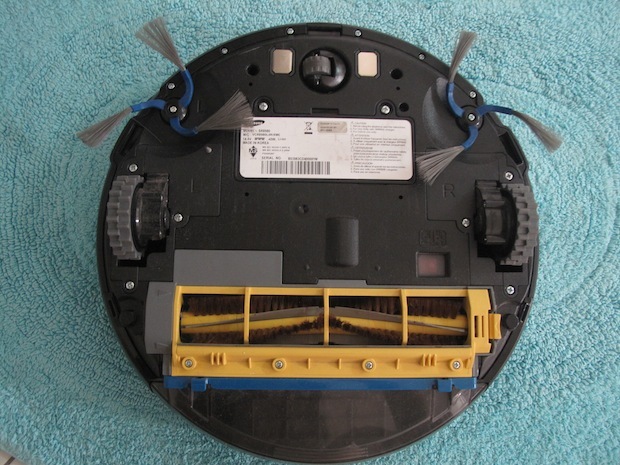 Lacking voice instructions – The last robotic vacuum cleaner had a voice guidance system. It will communicate problems through a recorder. For example, when the bin is full, the machine will say “Empty the dustpan”. We thought it was more of a perk than a necessity. 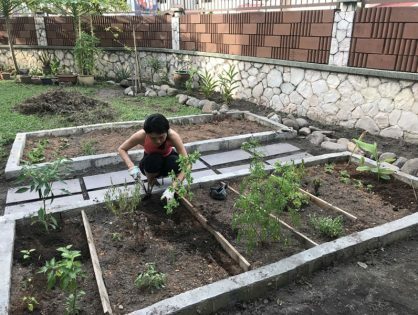 Without it, however, it take some time to figure out what is wrong when the machine. Bulky and heavy – The charger station is bulky and heavy. It takes up a lot of space and difficult to move it around. However, that this is probably unavoidable as the charger dock holds a huge dustbin. Difficult to turn on and off- The on/off button is located at the bottom of the machine. It means that to turn it on, you will have to flip the machine to the back. It would be easier if it was located at the side. Samsung Navibot S battery last for 100 minutes. It means it can continue cleaning for 1 hours and 40 minutes before it goes back to the dock to recharge. It needs to be charged for 3 hours after that. The battery life depends on the frequency of usage. It approximately last for 500 charges. Note that charge cycles vary by use, environment and settings. The battery costs RM 117.40 per unit and can be purchased at Samsung service centres. It does not pick up hard or sharp objects such as glass, nails, screws, coins, and etc. 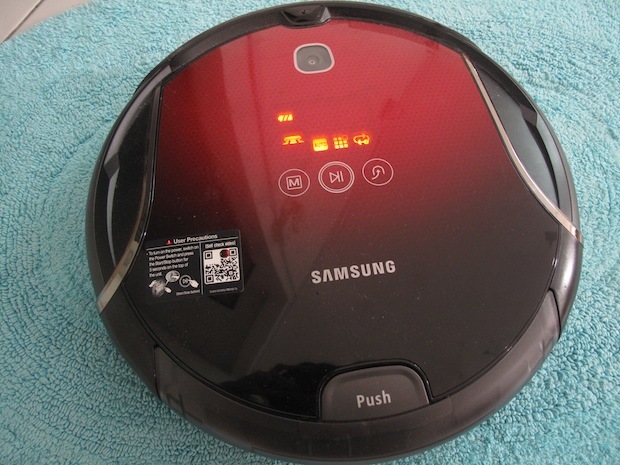 Like other robotic vacuum cleaners, they are disadvantages which we have mentioned in our last review. 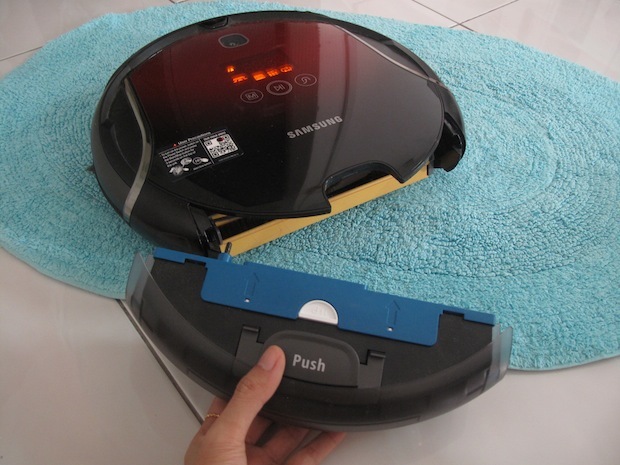 For example, a robotic vacuum cleaner cannot move up the stairs and cannot clean wet surfaces. It has two ‘virtual guards’ which create a virtual fence which stops the machine from crossing over a space. If you do not want the machine to enter your kitchen, put two guards at each end of the door. 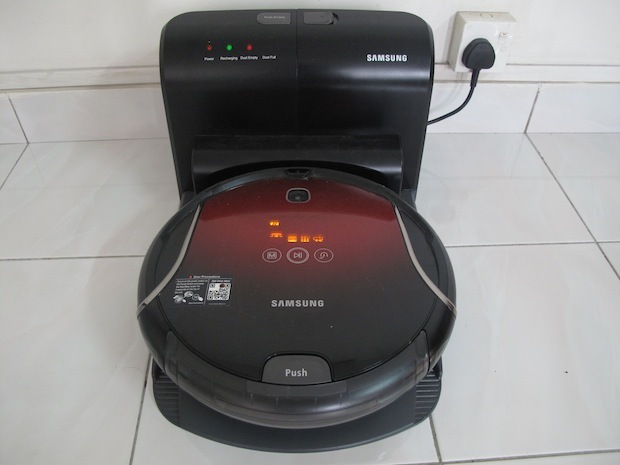 Samsung Navibot S does its primary function very well – i.e sucking up dusts and debris – leaving a smooth and squeaky clean floor. The parts are also easy to clean. However, it is not user-friendly and needs monitoring. The noise during emptying of the dust is a deal-breaker. Who cleans the for at your home? Human or robot?